Farm Machinery Parts from Barlows Agri Ltd.
We carry a vast and wide range of spare parts to suit most of our main new sales franchises as well as other makes of agricultural machinery. Our factory trained parts personnel can help to identify your parts requirements quickly and easily. Utilising the latest parts ordering systems from our major suppliers, we are often able to order parts in for overnight delivery to ensure your machinery is up and running in the quickest time. 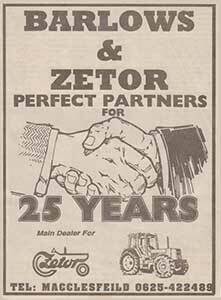 In stock we carry the largest range of Zetor spare parts in the UK. We also have thousands of good quality second hand parts for these tractors, especially the ‘older’ Zetor tractor, so give us a call and we are positive we can help you out. In addition we also carry and can order in a wide range of aftermarket spare parts from leading suppliers and also have vast stocks of Krone and Merlo parts and over £1.5 million worth of parts in stock including general fast moving parts such as PTO shaft parts, etc. Barlows Agri Ltd. also stock many other leading makes of farm machinery parts, so please contact us with your requirements and we will do our very best to get you sorted.